Lined jacket, above-waist has short sleeves. 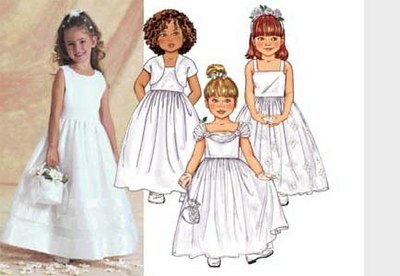 Lined, flared dress, evening length has close-fitting bodice, dirndl skirt, tie-ends and back zipper. A,B: purchased flowers. A,B,C: contrast overskirt. B: contrast drape. B,C,D: shoulder straps. Purchased petticoat, ribbon and veil. D: Contrast Bodice & Tie Ends. Dress A, B, C, D, Contrast D & Jacket: Crepe, Matte Satin, Taffeta and Jacquard. Contrast A,C: Organza and Georgette. Contrast B: Tulle and Novelty Netting. Unsuitable for obvious diagonals.